While in Palm Springs a few weeks ago, Greg and I walked through many homes that blended indoor-outdoor living so well, it was uncanny. Wide open walls of glass slide open onto lush yards that make the house & its living space go on and on. And of course, they all have in-ground pools that are impeccably kept. While we live in Michigan, and outdoor living is absolutely impossible for at least five of the 12 months, we do plan to be outside often. And a good way to do that, is to start eating dinner outside. 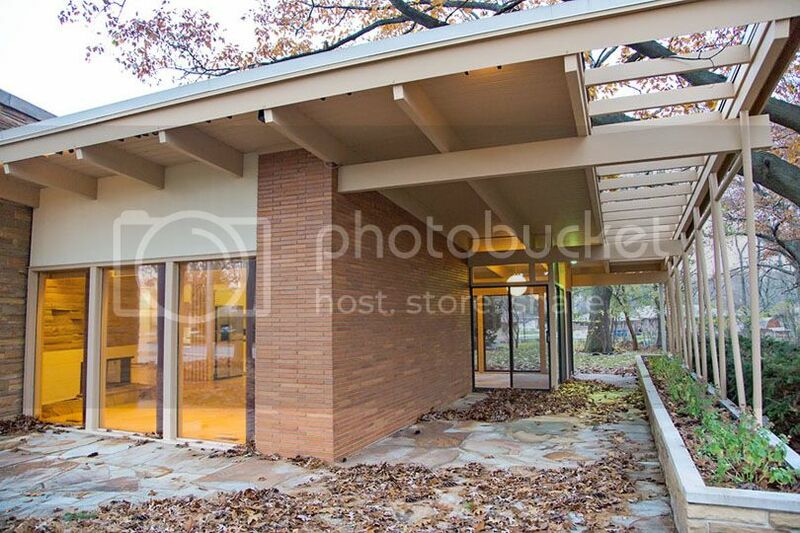 Selling features for us included the large overhangs and patio that surround the entire home. On the south side of the home, above, is the largest overhang, creating an outdoor room perfect for our dining room table. You access this space by walking through a slider from the three season porch, which you can see on the right. The windows in the left of this image, are the floor-to-ceiling windows that do no open, and look into the living room. Since we've never invested in new outdoor dining furniture while living on Louise, we plan on doing that soon. I've been using a glass patio table my mom had when we were kids for the past eight years, with inexpensive chairs, which I sold last fall on Craig's List in hopes we'd invest in something a bit nicer soon. And when I started the search, I was IN SHOCK at how much patio furniture is. 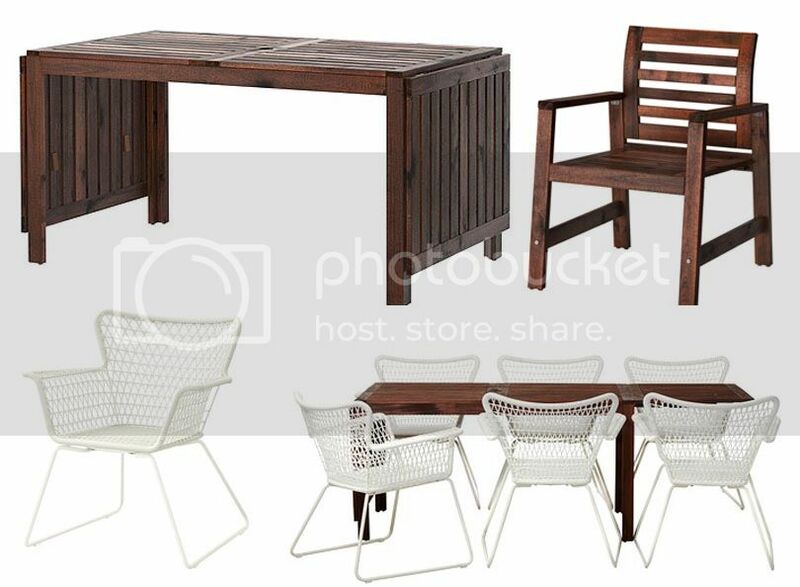 Thankfully, we scored a teak sofa, love seat, two chairs & an ottoman for the three season room on Craig's List, so it was only a dining room set that we needed for outside. While I continue to look at Craig's List for a set I love (or even just like...), I haven't seen a darn thing that comes close to what I can get at IKEA prices. I've been eyeing IKEA and their outdoor furniture online for months, but our local store just recently got a few of their displays put together for us cold-weather shoppers. And just like online, the one I like most is the APPLARO set, because the table is HUGE and very affordable. The table has fold down sides, so can seat 4, 6 or 8, and possibly 10 at a time, if the plates aren't too large at the end! It's only a 30" wide table, which is a standard size for a banquet table, so will fit in our space very well. As far as chairs go, the wooden ones that match are fine, but might be too matchy-matchy for this gal. I also like the white chair option. Kind of lends a more modern feel to the whole set, and price difference isn't much and I can imagine this set out there with lots of fun linens to make the whole place feel more like us. The next set that I like is the FALSTER set in gray. This would only seat six people max, but honestly, I am not sure how many times we'd be having 10 people for dinner, so might work well. It's a bit more expensive than the APPLARO set, but I LOVE the gray, and I also like that there are two chair options - one with arms, and one without. While the outdoor space is very orangey and warm, all of the mortar between the bricks in gray, and I plan on using lots of gray with the entire house, so this works for me. And the final set that caught my eye is a nice blend of white and wood. Another wonderfully priced set, the HASSELON table & chairs looks both warm (the wood table top) and modern (the white powder coated aluminum). This is another set that would set up to six adults for dinner, so not exactly what Greg and I were initially looking for, but might work well in the end. This is not in stock at our IKEA, so I haven't seen this one in person yet, as I have the other two. I'll keep you posted one what we end up with - we plan on making the trip in the next month to pick up a set so they don't sell out before warm weather hits, and then we have to wait another year! Love the grey! You could also paint the cheaper chairs in a nice accent color -- aqua? Navy? Chartreuse?